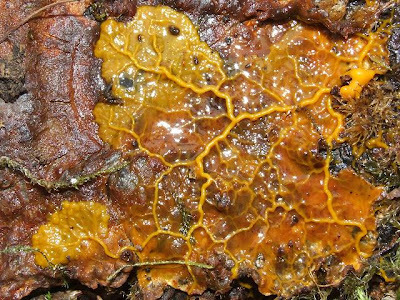 Should slime mould run our transport system? Slime Mould thinks that the A1 should be dualled. Actually, that's a bit of an exaggeration but not much. Physarum polycephalum is a very clever organism which spreads as it searches for food. It does so in a very efficient way and scientists have found for example that it can find the best way through a maze. They have also experimented with getting it to map transport networks. Two scientists have just reported* that they had food representing the UK's major cities, put the organism on London and watched. The result pretty much matched the UKs motorway network - except for the route to Scotland which went through Newcastle and northwards. A lesson surely for the Highways Agency. Our local Conservative Parliamentary candidate has kick started a dual the A1 campaign; this obviously provides intellectual support for that campaign. If Slime Mould could vote, it would surely vote Conservative. If I'm honest, however, I'd have to admit that the scientific evidence is not really there to confirm that, and also I'm not sure that having Slime Mould as a supporter would be a good marketing pitch. Plasmodium of Physarum polycephalum is a single cell visible by unaided eye. During its foraging behaviour the cell spans spatially distributed sources of nutrients with a protoplasmic network. Geometrical structure of the protoplasmic networks allows the plasmodium to optimize transfer of nutrients between remote parts of its body, to distributively sense its environment, and make a decentralized decision about further routes of migration. We consider the ten most populated urban areas in United Kingdom and study what would be an optimal layout of transport links between these urban areas from the "plasmodium's point of view". We represent geographical locations of urban areas by oat flakes, inoculate the plasmodium in Greater London area and analyse the plasmodium's foraging behaviour. We simulate the behaviour of the plasmodium using a particle collective which responds to the environmental conditions to construct and minimise transport networks. Results of our scoping experiments show that during its colonization of the experimental space the plasmodium forms a protoplasmic network isomorphic to a network of major motorways except the motorway linking England with Scotland. We also imitate the reaction of transport network to disastrous events and show how the transport network can be reconfigured during natural or artificial cataclysms. The results of the present research lay a basis for future science of bio-inspired urban and road planning. 1. Better Government Initiative ; a body mostly comprising retired Civil Servants have produced a set of ideas to improve the way Government works, legislates and is monitored. and they do not deal with the increasingly close arrangements between ministers, civil servants and the industries and areas they supervise: since Labour changed the requirements it has become much more common for ministers and civil servants to get jobs in connected areas. This increases the possibility of corrupted decision making. But overall I think they are useful. The report tries to be party neutral but it is clear that the rash of short term initiatives and special advisers which have developed in the last 13 years means we have less effective Government. 2. The National Equality Panel (a Government sponsored agency) has produced a report on " the distributions of various kinds of economic outcome on the one hand and people's characteristics and circumstances on the other." Unsurprisingly, it reports that most measures of equality have worsened in the last 13 years (and to be fair during the last Tory Government). It suggests that despite a blizzard of announcements, initiatives and taxpayers money things have not got better. I think that Labour's poor performance despite wanting to make a difference is because it has a conflict between political correctness, a desire for economy and a distrust of the voluntary and private sectors. Can the Tories do any better? Well, they could hardly do any worse, and I think the focus on pragmatism will help. And of course: every Tory Government in the last 100 years has left office with employment higher than when they came in. Here's two other indications they have could something useful to say: IDS's Centre for Social Justice, and this review of David Willets' book "The Pinch"
There's a well known phrase in financial markets: the dead cat bounce. If you drop a cat (sorry cat lovers) from a high building it will bounce when it hits the ground. That doesn't make it alive. Equally, a recovery in markets after a steep fall doesn't mean the market has recovered: it could be a short term bounce before things get worse. 2009 4th quarter GDP growth was estimated at 0.1%, it was announced yesterday, which means the UK recession is over - albeit we are the last G20 to come out of recession, and the one with the most anaemic growth. And 0.1% is so small it could easily be zero. However, the cynic in me thinks they may have made Q4 look worse than it really was so the GDP growth/fall for Q1 2010, which will probably be announced just before the general election, will look better than it really is. As I was looking for an article on the announcement to link to above, by the way, I spotted this article about Ireland coming out of recession faster than the UK - which was one of my 2010 questions. I chose the Wall Street Journal for my link to get an international rather than a domestic perspective on our GDP recovery. It wasn't cheerful. I always seem to end up writing about banks and their place in the economic situation – I suppose it’s because I know something about them, and to be fair they are important at the moment. Obama announced a change to the framework of how banks should operate during the week – cynics would say it was a populist reaction to the Republican gain of one of the senate seats for Massachusetts. It probably was, but that doesn’t make his ideas bad. In brief, he wants to reduce the risky activities of banks taking customer deposits. In essence, this should reduce the size of banks so they are not too big to fail and mean riskier ones could fail without ruining the financial system. His announcement obviously covers US banks; given the US political system it’s too soon to have full details of the plan, and too soon to guess how it will end up after Congress has had its say. But in principle, I think it is one of the essential steps to reforming the financial system. Yet our Government is briefing against it – saying that America should not act alone, and that the work of the G20 could be damaged. The Sunday Times has a big interview with Alistair Darling along these lines. How sad: the G20, through which our Government claims to lead the world in resolving the financial crisis, has actually done nothing. Nor has it shown much evidence of ideas to do anything. In the last month, Obama has announced two useful changes (this, and the levy on net assets). Fortunately the US is big enough for its ideas to be followed by other major economies. As I’ve noted before, I think there are two other things which should also be done: tighter capital regulation and a serious competition review to tackle the profits banks make. The Evening Standard had an article on Cadbury’s takeover by Kraft as an interesting example of how banks make big profits. And an interesting example of how an effective competition review would be hard to do. The takeover, which has a decent chance of damaging Kraft as well as Cadbury’s business, cost Kraft and Cadburys about £240m in fees. That’s a lot of money for not a lot of work – the reason it’s so much is because the deal mattered so much to Kraft and Cadbury. The importance of winning mattered so much that neither company particularly cared about the cost. And of course, the shareholders, not the managers, pay. The new Massachusetts senator has a lot going for him. It was a surprising Republican victory, and was an early indication of one of my New Year questions: would US voters give Obama time to put right what was wrong? The answer appears to be no, although apparently the Democrat candidate was pretty useless so this may not be a final answer. Republicans very forcibly highlight increased deficits as an indication he is making America socialist – forgetting that most of the deficit arises from the bail-out and structural deficits of the Bush administration. Bush was almost as cavalier with other people’s money as Brown. It also highlights a real problem for David Cameron if the Conservatives manage to win the next election (particularly if they have a narrow victory, which is probably the only type of victory they will get). Voters seem to want quick results: they may not have the patience for a long haul, and if there are voter pressures then MPs may not support difficult action. I know Cameron is trying to balance being realistic with not being negative: he wants to point to the City upon a Hill. But I worry that he is not setting expectations properly. Putting the country’s economic and social problems right will take years and he needs to highlight that now. Better to lose the election than to win it without a mandate so he then fails. A hung Parliament is the most likely result (I think) yet its one most people don’t want. I assume they sense the need for clarity of management and that is unlikely where Parties have to work together. The Week in Westminster had a debate on Saturday about whether the Parties should be explicit about what they would do if there was do if no-one had an overall majority. I can see the point, to give voters more information, but I’d worry that planning for it makes it more likely. Politicians don't usually get me really annoyed - I did after all try to become one. But a comment from one of the leaders of our Council in yesterday's local paper made me angry. I haven't talked much about our local Council, in case people feel its just sour grapes. But it has been a dreadful performance since the start, mainly because the Lib-Dem adminstration was slow to get a grip on finances and then was captured by Council officials. I know they had a difficult job, having been left with a Council in a shocking state and a reorganisation no-one wanted. But still. Anyway: the annoyance. The local Tory leader was having a go at the Council for not getting to grips with the bad weather, specifically by having an "emergency" meeting about it three weeks into the bad weather rather than sooner. He also noted that a pretty poor job had been done of clearing the snow (to me, that's obvious unless you live in places like Cramlington, where Alan Armstrong the relevant Lib-Dem Councillor is from, or Morpeth, where the Council offices are). In reply Armstrong implied the Tories were dismissing the "hard work of our dedicated staff". That is such a typical politicians trick: pretend any criticism is of front line staff doing their best, rather than of the leadership who have failed to give them proper resources or direction. Its a trick used against the Conservatives all the time when they are trying to make the public sector work better. Such criticisms aren't of front line staff; they are of political leadership. This was a small example but having suffered from such poor road clearance at home, it was very relevant. Also on the subject of snow, there was an interesting article in the London Evening Standard about the disruptive unintended consequences of Government action, especially when it is taken for publicity purposes. Its particularly annoying given the Governments action regarding farmers trying to help people; in many parts of rural Britain we had to rely on the goodwill of local farmers to keep the roads clear and to get deliveries through. The former in particular meant they used farm vehicles. Many farm vehicles are not registered for road use and can use cheaper red diesel as a result. A joined up Government, recognising that there were serious problems with road clearance and maintenance, would have encouraged farmers to help by stating that they could temporarily use such vehicles on the road. A useless Government would have done nothing. A vindictive Government, not caring about the public (especially the rural public) would have sent out reminders from HMRC to farmers not to use such vehicles on the road. Actually, I suspect it was not even vindictive because it wouldn't have been planned. It was a result of 12 years of a Government generating an attitude within public service that the public don't matter. Obama has announced a plan to tax the banks in the US. It is seeking to recover the cost of the bailout of the banks in 2008/9. The bailout was primarily successful because the taxpayer implicitly guaranteed the financial system. In some cases we had to put capital into banks (eg RBS) but even banks like Barclays which avoided public money (or Goldman Sachs in the US which has paid back money it took) have massively benefited from the stability and lower cost of funding resulting from the taxpayer standing behind all banks. It is right that we did this (although I am sure it could have been done better and quicker) because we need banks to support business and the economy, and it is right that banks become profitable again so they can rebuild their capital. But as taxpayers we have not yet charged a fee for our service. I have said before that the problem with the super-profits in the banking system post credit crunch is the lack of such a fee, and that the banking system chrges fees that are too high. This is a competition issue. The US tax deals with the first problem, and does it over the long term: it is designed to charge more to banks who rely on wholesale finance, rather than customer deposits - in other words risky banks will pay more. The UK's silly tax on some bonuses but not others does not do this; its not based on the riskiness of business areas, its not seeking to encourage "good" rather than bad banking, and if it changes behaviour it will only be to put some business offshore. And although it will raise more money than expected it won't come from employees, it'll come from the bank's capital which will slow down the lending they can do. You know how Brown keeps on saying he doesn't want to stop the recovery by stopping spending. Well, this is going to have a bigger harmful impact than getting the deficit under control: this impacts real businesses immediately. A final point: its another example of how the UK has not led the world in sorting out the credit crunch. We have been an inwardly focused country which has not been able to provide intellectual leadership because our system of financial regulation was ineffective and our levels of public debt hardly an example to follow. Hopefully, other countries including the UK will follow the US lead. The new body established to manage MPs expenses is asking for comments and views from the public here . I've just completed it - it doesn't take too long, and I think it would be good if as many people as possible responded. In general, I think their suggestions are OK but there are one or two areas, particularly travel, where they should have left the Kelly report untouched. I concluded by saying that they should simply have used the generally accepted framework from Kelly. I was always worried that letting MPs off the hook by having an independent body set their pay and allowances would further fuel their ability to take money from us. Rumours are floating around that the New Labour crony who has been appointed as the expenses watchdog is going to come up with some generous alternatives after the hairshirted approach of 2009. See this Sky blog comment. The latest gilt auction got away - so far the Government has been able to fund its borrowing needs. But at what cost...? Analysts said the auction stock had appeared cheap relative to neighboring issues on the yield curve. The healthy demand for the paper was expected, "given the pressure on U.K. banks to buy the so-called high grade quality assets that gilts are meant to be on their bank capital books, with the patent cheapness of the stock relative to its peers, and the very steep profile of the front of the U.K. gilt curve offering obvious attractions," said Marc Ostwald, Monument Securities strategist. Furthermore, Wednesday's Bank of England buyback made the auction even more attractive, he added. Jason Simpson, market strategist at Royal Bank of Scotland, agreed, saying the issue should also be eligible for the BOE's three-year to ten-year buyback expected on Jan. 20. In other words they were sold because the interest rate we taxpayers have to pay is high, banks are being made to buy them and the Bank of England may buy them back anyway. The Tories can think of nothing worse than Gordon Brown being replaced as Prime Minister. Yes, it would show that Labour was inwardly focused and had previously been lead by the wrong people. Yes, it could cause dissent from Brown supporters (unless their man got the top job). But it would also refresh Labour, give it all sorts of new campaign possibilities about it being a time for change and allowing it to jettison previous mistakes. Yet despite being given the opportunity by Hewitt and Hoon to replace him, Labour are rallying round to keep him. He has brought us to near economic ruin, created a dangerously complex benefit and tax structure and (not his fault) is generally unlucky. But Labour can think of nothing worse than replacing him (because no-one wants to risk standing as leader in case they lose?). It's surprising that the two parties - whose styles and personalities of management are very similar - look at the same issue with such a different perspective. It's also surprising just how long bad leaders - not just in politics - survive because no-one dare trigger change. I had a few days in Thailand before Christmas. It was warmer than here. I stayed with friends who live in Phuket and therefore met a few of their ex-pat friends. I tried to work out why they all seemed more relaxed. Could it be many were retired? Or that they live in a bit of a tropical paradise? Possibly these sorts of reasons. But also: they don’t have a diet of daily news. What is happening in the UK is mostly not relevant. Most of what happens in Thailand does not affect them. World trends can be picked up from the internet or occasional news bulletins. Just as in Spain – where a large ex-pat community has been surveyed – people also tend to have a more negative view of life back home than even we who remain. This is partly to self-justify the change in lifestyle but also because again they can step back from day to day pressures of news and just live their lives. I am a news junkie; I listen to Radio 4 much of the time and often check the news on the internet during the day. Not everyone is as bad as me: but we do have a regular and perpetually updated flow of news. And to be interesting it is usually concerning. I wish I could learn to avoid it – and I think we would be a much happier nation without so much news. Perhaps a once a week update would be enough, as very little changes week on week. 24 hour news is a great achievement: but it’s also an example of an old law: the late Patrick Hutber, moved to cynicism by the irresponsible antics of politicians, businesses and bureaucrats, formulated Hutber's Law, which states: "Improvement means deterioration". At the start of each year the FT asks for predictions of economic trends for the coming year. In both 2008 and 2009 the closest prediction of house price changes was made by a fox cub in the garden of one of its commentators. (The cub selected one of a number of marked pieces of meat). Apparently he has used a different cub for 2010: now it has grown up the previous one is presumably an analyst in the city or an economist for the Government. 2010 will give us an answer, determined by how Eire recovers from the recession. The UK and Eire are both in an economic mess - it's hard to say which is worse. But the Irish Government has done something about its situation, taking radical action to adopt bad assets from banks and to cut Government spending, particularly cutting public sector pay. The UK has done nothing except try to establish dividing lines with the opposition. Indeed, by refusing to get a grip on spending while doing nothing to make banks work again, I think it has made matters worse. Eire has a real problem in that it is a member of the Euro, which restricts its flexibility and gives it an inappropriate exchange rate, so it should recover more slowly than the UK. But 2010 will show whether the strong action it took means it will in fact do better. Evidence, by the way, suggests that growth comes from the private sector and cutting deficits in a recession can help. A couple of very good articles in the Sunday Times highlight the poor value we now get from the public sector. (Sadly, this sort of comment always now needs the rider that it doesn’t refer to the oppressed front line staff doing their best to help people: of course it doesn’t, it refers to their management and direction after twelve years of mismanagement following previous excessive centralisation). One referred to costs: since 1997, the number of public sector workers has increased by 20%, while their productivity has fallen by 3.4%. Over the same period, private sector productivity increased by 28%. Average public sector pay is now 7% higher than the private sector although their working week is on average 2.5 hours less. And of course this is before pensions: the retirement age is much earlier and most public sector pensions cost around 20% more than private sector ones. The second referred to quality: the fact that so many rules have been introduced with (presumably) unintended consequences of networks and society (yes, there is such a thing...) being damaged and people becoming passive. Everyone suffers, especially the voluntary sector. Read the article for examples – I’m not going to repeat them. These problems are not new: they have taken over a decade to become engrained. Correcting them will take at least another decade. It is encouraging that having been ignored by most of the commentariat for the last decade they are now starting to be written about. 2010 could be a year where the public slowly start to take the public sector back under control. I hope so. The heatwave in 2003 provided a catalyst for many to accept that Carbon Dioxide emissions were causing a problem, and that global warming was occurring leading to ice melting and sea levels rising. Amongst other disasters. I am biased as my house is about 30m above sea level, and as I am writing I am looking at snow covered fields for the third week running. So I wonder: will this cold winter be a catalyst for people to start questioning the global warming industry? Many livelihoods depend on global warming being accepted as a threat – I mean the quangos, the lobbyists, the alternative technologists, not the poor who need help now – and they will be determined to stop a debate. But reporting of the falsification of data and the censoring of alternative views in scientific journals has started; the Copenhagen conference was an overblown fiasco of intolerance, although China and the US somehow managed to cobble together a useful intent to reduce emissions. 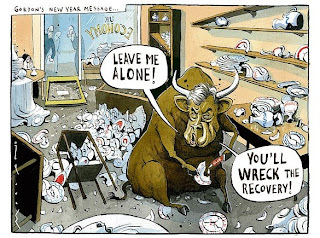 The cartoon is from The Times, December 2009, Peter Brookes. 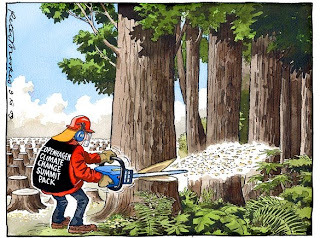 The lumberjack's jacket reads Copenhagen Climate Change Summit Pack. As I wrote last year, I have split views on this topic: instinctively I distrust the unthinking certainty of climate change enthusiasts leading to interference in our lives, but it’s also obvious that in many ways we are wasting resources and polluting the planet. Resources are wasted because they are not properly priced: we use them as though they were free. As I wrote last year, I suspect the solution to global warming will come from new technology of which we are not yet aware so both nationally and internationally we should support pure as well as applied scientific research, paid for by properly taxing energy useage. 2010 could be a trend changing year where climate change deniers become respectable again. That is so the opposite of the truth. The Bush administration left a real mess behind: massive deficits, a recession, an uncontrolled financial sector and a failed strategy for a war on terror which left hundreds of thousands of people dead, Afghanistan, Iraq and Somalia in ruin and a lack of credibility to deal with Israel, Palestine and Iran. And yet as Obama has slowly tried to unpick the mess and move forward he has come under sustained abuse from the right. His popularity has fallen substantially. The mid-term elections in November will be a good indication of whether or not the electorate support his charisma and calmness; this in turn will indicate the cultural direction of America for the rest of the decade. There’s another lesson here: Government actions are long term yet they are sold as short term: electoral judgements are often therefore short term as well. It usually takes two or three years for a change of Government to have any impact – so the problems in the first two or three years of a Government are usually those of the last one. Iran is potentially a civilised country with a great deal to offer the world: it is run by a cruel regime which can cause a great deal of harm. But there are cracks, signs of a limited insurgency. If the regime is able to reinforce their control during 2010 then it’s not a good long term sign for stability and therefore economic growth. Conversely, a new Government would be good in the long term even if there were some short term uncertainties. I have little to say except to note the massive resources devoted by the US, the UK and others to this area, the fact that it is one of two or three cradles of terrorism, and one of the major drug producing regions, and that it is probably the most unstable holders of nuclear weapons. What happens in 2010 matters to us all. It’s hard to see a good outcome.